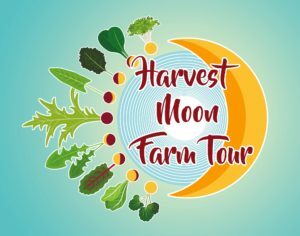 Saturday, Sept. 8 to tour three local farms that have met the challenge in unique ways. Meet the farmers and hear their stories: how their farms evolved, lessons learned along the way and why they are passionate about what they do. Taste a variety of Alaska Grown wines to complete the tour. 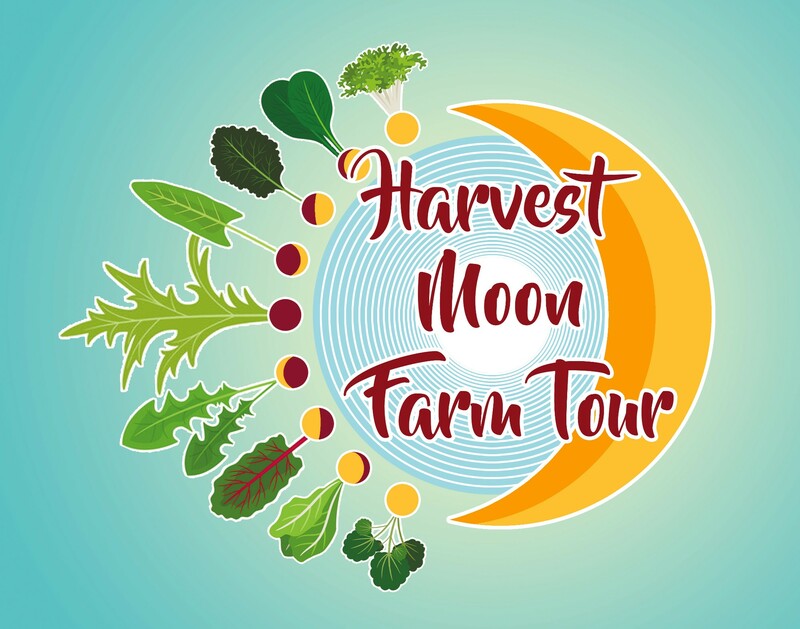 This tour, sponsored by Kenai Soil & Water Conservation District and Kenai Local Food Connection, in collaboration with Alaska Farm Tours, is the special kick-off event for Harvest Moon Local Food Week, Sept. 8 – 15, 2018. 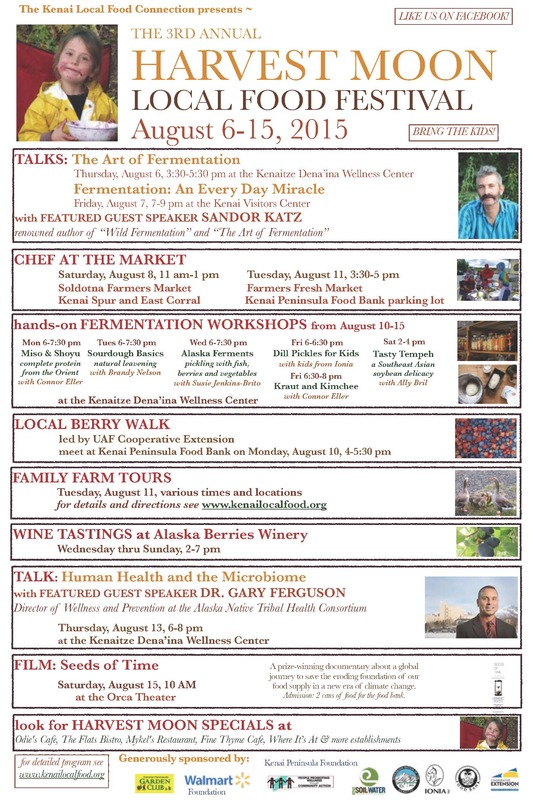 See the full schedule of Harvest Moon events at www.KenaiLocalFood.org. Do you understand how the Food Safety Modernization Act (FSMA) will (or will not) impact your small farm? On-farm food safety, FSMA, intentional crop planning and post-harvest handling are some of the topics to be covered in a free workshop to be held Saturday, Apr. 8, 9 am to 5 pm at Cook Inlet Aquaculture Association in Kenai. We are fortunate to have Atina Diffley of Family Farmed coming to lead the workshop, as well as a similar workshop in Homer on Apr. 7. 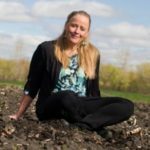 Atina is an organic farmer, top-notch presenter and author of the 2012 award-winning memoire, Turn Here Sweet Corn: Organic Farming Works. 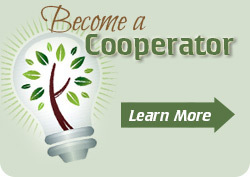 This don’t miss event is co-sponsored by Homer Farmers Market and Homer Soil & Water Conservation District. There is no fee to attend. Bring your own lunch. And please register at http://tinyurl.com/FamilyFarmedAK. Questions? Email Heidi at kenaiswcd@gmail.com. (Anchorage, Alaska) May 2015 – The Alaska Farm Bureau announces the $5/Week Alaska Grown Challenge – a statewide campaign to increase consumer spending on Alaska Grown products with the goal of strengthening local economies and increasing Alaska’s food security. In a small, gray Atwood Building conference room, half a dozen state commissioners passed around a surprising snack: An enormous bowl full of yellow, purple and bright orange Alaska-grown carrots. While carrots might not seem like the most expected snack for a high-level early morning meeting, it made sense Monday, when commissioners from various state departments came together in Anchorage to talk about one thing that ties all Alaskans together: food. It was the first meeting of the Alaska Food Resources Working Group, a committee set up under an administrative order by Gov. Sean Parnell this summer to recommend measures to increase the purchase and consumption of Alaska seafood and farm products. The goal is to identify challenges while, at the same time, increasing coordination within government agencies.